As Autumn draws in, it is always a harder time of year to stump up the motivation to go for a 5am run in the dark or a late evening run after work. However, with an important race in my calendar approaching in November I need to keep focussed and motivated. Aside from the darkness, is getting used to the quite sudden change in early morning temperature before the sun rises. It is by no means freezing here in Bath, but it does make you think twice about what to wear for these difficult mid-week runs. Whilst it is not yet wet or muddy enough to test the shoes, the aforementioned morning conditions have proved perfect to give the tights a whirl. Firstly, I am not a fan of compression clothing. I feel restricted in it and I personally find it a hindrance as opposed to a benefit. At the same time, I don’t like hugely loose fitting running gear either so I try and strike a balance. In the summer I have used the Race Ready pocket shorts and whilst tight to the skin, they are not full compression and have been simply excellent. 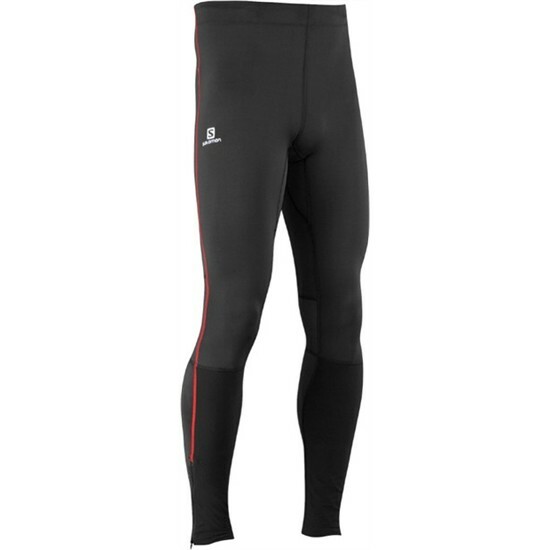 In looking for a winter tight that works just as well, I feel I have hit the jackpot with the Trail Tight M.
At £50 they are good value for money and match price wise with some much lesser brands. Salomon does have a reputation for expensive equipment, but these are excellent value I feel. You could easily pay double for a rival brand that offer nothing in addition to these tights. The material is 90% PES and 10% elastic, making them a comfortable fit. The material stretches to fit an individual’s body but they do not feel claustrophobic like I have found with compression. They are advertised as offering ‘light support’ and this is exactly what it feels like. Running in Autumn means I quickly warm up and with the mesh ventilation I have not felt like I am overheating at all. In areas where us men can chafe, and for me it is worst on my thighs, the level of support and fit has meant no skin to skin contact, even on a thigh expanding four hour run last weekend. The bottoms of the legs feature the standard tights zip fitting to close them at the ankles. Unlike most brands, the zips are on the outside of the leg, not the inside and I have found this much better as there is never any contact on a narrow section of trail like there can be with inner leg zips. On the knees, there is no restriction and I haven’t found I need to alter my stride at all. The stretch is very subtle and this makes them a natural choice for people who want to stay warm but run as they do in June. There is a drawstring on the waist and a small pocket at the rear to store keys or a gel or two. I am really impressed with these tights and I would certainly recommend them to runners looking for a winter tight in the UK. If you prefer compression, these are not for you, but if you want to feel like you do in shorts in the summer, but keep warm and dry- these are your tights.